Today we are going to meet Simon Lethier, 35 years old. 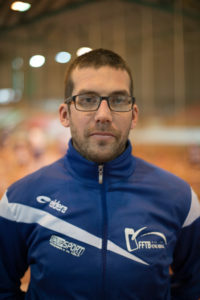 In his professional life, he is the director of a sawmill, and he is president of the Tchoukball Club Comptois, which was founded 6 years ago. He is also the coach of the France national team. Meet this man with multiple hats, who puts on these different roles with ease. Simon, do you remember your first participation at Geneva Indoors? Simon Léthier (S.L. ): Yes, I remember it correctly. It was in 2012, and our team was playing in the open category. What is your best memory of this event? S.L: Still in 2012, I attended the Nations Cup. I then realised the European level, which at the time was very high. For me 2012 was a pivotal year in Tchoukball and from that day on, I understood the extent to which Tchoukball is taking place all over Europe. For several years now, we see French teams with more dedication and much more severe at international events. How do you explain this change of mentality? S.L: The French federation decided to thoroughly review its philosophy and organisation. Now national team coaches will for example no longer be players, because it is difficult or impossible to play at its best while coaching at the same time. We are also putting much effort into training, to create a good foundation for the future. France is a country that is traditionally very successful in team sports. How long do you think it will take for Tchoukball to be part of the top international teams? SL: Yes, in France, we often have good results in team sports. I think our margin of progression in Tchoukball is enormous. It’s up to us to be inspired by sports like football, handball or basketball to put in place a solid structure that is already starting at the junior level. This structure must allow our young people, who are starting Tchoukball, to acquire much experience in our sport and then be able to compete with the best nations. In a country as big as France, how do you organise manage the national championships? S.L: It’s straightforward, our organisation is similar to American sport. France is separated into three leagues: North League, South League, and Reunion. There are two tournaments per league, and the top two teams in each league compete in a third tournament, which will determine the winner of the season. How do you manage the national team? Also, little by little, a new generation of young people is coming up – how do you manage to integrate them into the French team? S.L: Every year we plan between 8 and 10 weekends of training for the national squads. There are currently 5 to 6 clubs that are regularly represented. At the beginning of the season, new people are joining. The doors are open, and everyone can try their luck and then be selected. No place is acquired according to the seniority, so there is good competition for the places available. What are your goals with the French national squads’ in the short, medium and long-term? S.L: Our priority is to continue to participate regularly in international competitions and events because it is during these moments that we can learn a lot and gather as much experience as possible. It will then be about transmitting this knowledge to our young people. The latter, who play tchoukball since their teenage years, will be able to fight for a place in the European top 4 in the long term. In addition to your coaching role, you also participate in the Swiss Championship as a player of the Tchoukball Club La Chaux-de-Fond. What did it bring you the most? How do you develop the collaboration between Switzerland and France? S.L: My experience as a player in La Chaux-de-Fond allows me to convey rigor and technique so that tchoukball in France evolves intelligently. Being attentive and asking the right questions to Swiss coaches is fundamental to my role as coach of the French national team. My experience as a player then allows me to target better the points that we must improve in France. 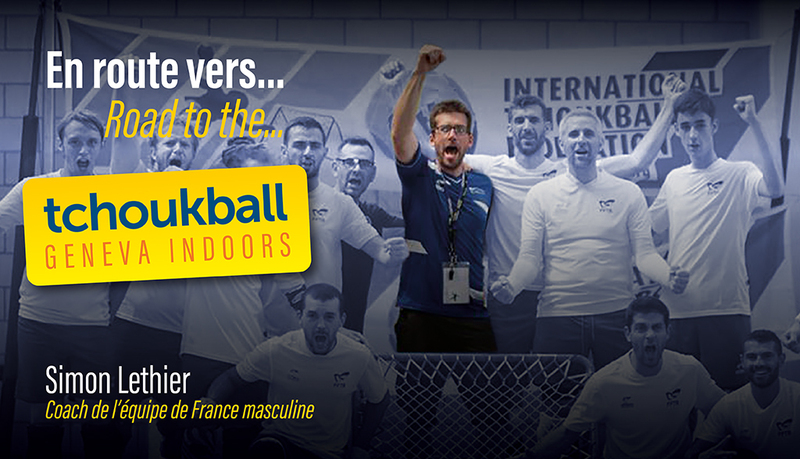 Year after year, the staff of Tchoukball Geneva Indoors strives to improve the event and make the TGI experience as pleasant as possible. What do you think of the changes that have taken place since you started to participate in the event? S.L: We feel a desire always to do better, every year the tournament wins in professionalism. The Geneva Indoors is, in my opinion, a must on the international level – and you only have to see the teams participating in it year after year. The staff tries to draw inspiration from international events from other sports to improve the TGI and attract the public and offer the best possible experiences. What are your expectations for the 2018 edition? How do you see the TGI in 10 years? S.L: For this 22nd edition I expect high-level games, with very motivated players, with the show and a warm audience. In 10 years I see the Geneva Indoors being played over a week, with qualifying phases and finals, with matches that are broadcast live on television. What would you say to someone who does not know Tchoukball to motivate them to follow this event? S.L: I tell him that this sport is unfortunately still too little known. The values it conveys are essential for adults and children alike. Tchoukball deserves more attention and the show at Tchoukball Geneva Indoors is guaranteed. Many thanks to Simon for answering our questions. We wish him all the best for this 22nd edition of the Geneva Indoors.